With Father's Day fast approaching, hopefully you've got a present sorted (if you're clueless, see my giftguide!) but have you got bought a card yet? You might visit a card shop to pick up a card, or you might grab one in the supermarket when you do your shopping. You might even send one online...which is where Dom and Geri come in! 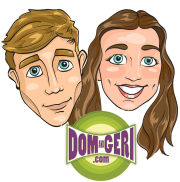 Dom and Geri is a quirky and fun brand who's website features lots of personalised greetings cards covering all occasions. What sets them apart from other well known online card retailers is that they offer matching personalised wrapping paper and gift tags - very useful and makes the present that little bit more special. Our selection included a variety of cute, traditional and vintage and they were all personalised with either my husband's or Elliot's name. 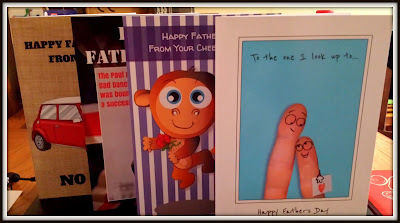 My personal favourite was the one you can see at the front of the photo - it's very cute but not in a mushy way and exactly what I'd look for when buying my husband a card from Elliot. There are lots to choose from on the website and definitely something for everyone. They even have a mature humour section for over 18's - it wasn't my cup of tea but I'm sure some will love it! The cards come as a standard A5 size and are priced at £2.49, with 60p for delivery. I think this is a great price for a personalised card especially as you will find some really unique and quirky designs that you won't find elsewhere. If you're not familiar with the Dom and Geri brand then it is definitely worth checking out their website, they have lots to offer and nice to have something a bit different from their well known competitors!